KS Engineers, P.C. (KSE) was responsible for the civil engineering design and streetscape improvements for the area of the Navy Yard known as the Historic Core. The Historic Core represents the heart and foundation of the Navy Yard, with its historically significant buildings, its strong urban street grid, and its large open spaces. With the redevelopment of the Navy Yard community, the Historic Core will again serve as the focal point for the area’s residential, retail, and commercial activities. 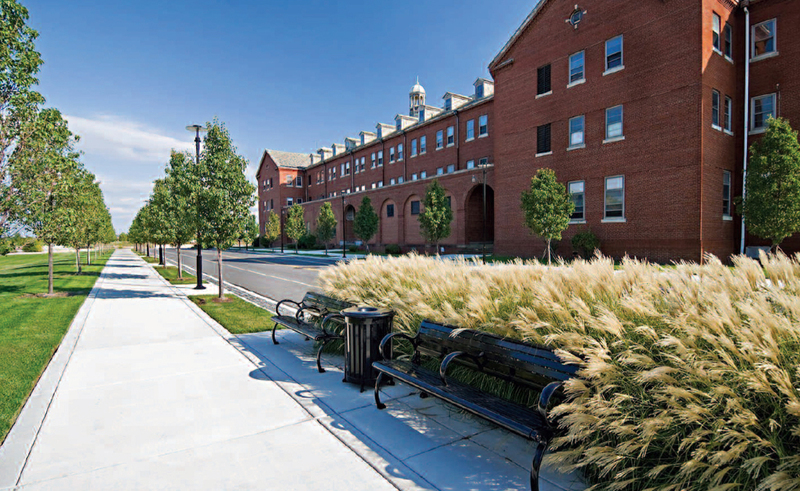 The purpose of this project was to re-establish the street grid where it has eroded in places and to develop streetscapes in accordance with the Navy Yard Design Guidelines. The project called for new water and stormwater systems, the realignment and redefinition of the curb lines of some streets, pedestrian lighting, new street trees, planting areas, and streetscape furniture. KSE designed two new outfalls into the Delaware River that combined 141 existing small diameter outfalls. The design included the bulkhead design at the point of outfall, pile layout, and timber sub-deck, and involved working with the U.S. Army Corps of Engineers, PADEP, and local agencies. KSE was responsible for the management of the complete project, the coordination of the proposed streetscape with the Design Guidelines and the client, the entire civil and utility design of the 14,000 linear feet of streets, the preparation of all construction documents, and the oversight of the construction as the Owner’s Representative. In order to expedite the construction, KSE fast-tracked the document preparation, which allowed for the bidding of an early construction contract for League Island Boulevard, Normandy Place, and the north end of 13th Street. The project also included the development of the 2.5-acre Constitution Park, the demolition of four buildings to allow for the relocation of 11th Street, and utility improvements completed in accordance with Philadelphia Water Department standards.